Spring Loaded Hinges can be configured for various tensions and to hold the hinge in the open or the closed position. Monroe Hinge & Stamping Company has the capabilities to manufacture Spring Loaded Hinges in a wide variety of lengths, metals and finishes. Monroe Hinge & Stamping Company is ready to work with you on developing the right Spring Loaded Hinges for your application. All of our projects start with a question, a print or a sketch. Spring loaded hinges are made to order to suit your requirements. We stock a variety of springs that can be used with hinge series 1435, 1240, 1267 and 741. When inquiring, please inform us of the weight of the door to be held open or closed. 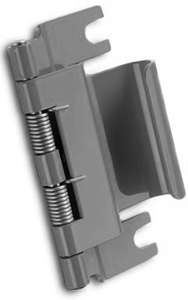 We will be happy to assist you in choosing the proper spring loaded hinge for your application. Are you looking for Spring Loaded Hinges?